SITE DESCRIPTION BY PRUITT: Within the Gneiss Belt mountains at an elevation of approx 2450 ft MSL. The property is mature mixed pine and hardwoods, which cover all but the half-acre house pad and driveway. The parcel is within a low density residential area, with lots being 2 - 10 acres in size. My own lot is 2.24 acres. I am currently preparing to build a 1200 sq ft home on the house pad and leave the remainder of the property in forestland habitat. My lot is one of the last lots in the neighborhood that is undeveloped. Other houses are likewise sited within the same forested habitat. No one in the neighborhood has cleared their land, all preferring to live within woods. I have neither a will nor descendants, so in the event of my death my property will be inherited by my sister. I cannot say whether she will sell the property or keep and use it herself. I have become a snowbird, living in North Carolina May 1  October 31 and in Florida the remainder of the year. 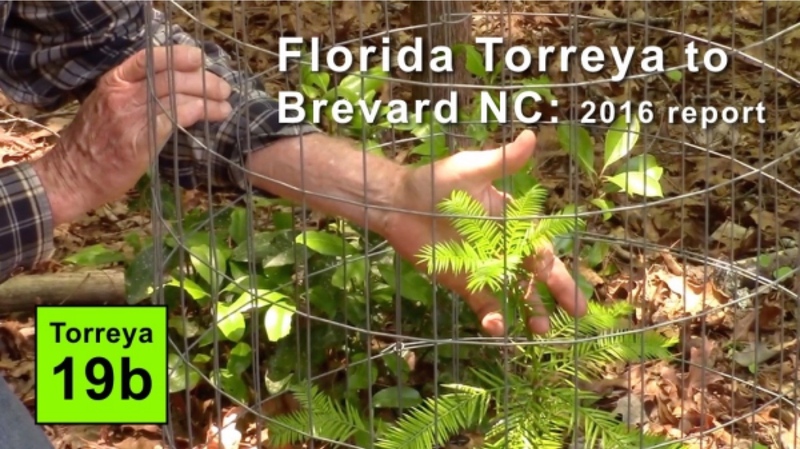 Brevard, NC: Buford Pruitt received in 2010 and 2011 newly collected T. taxifolia seeds by Torreya Guardians. PHOTOS ABOVE: These are stills taken from the video 19a above. 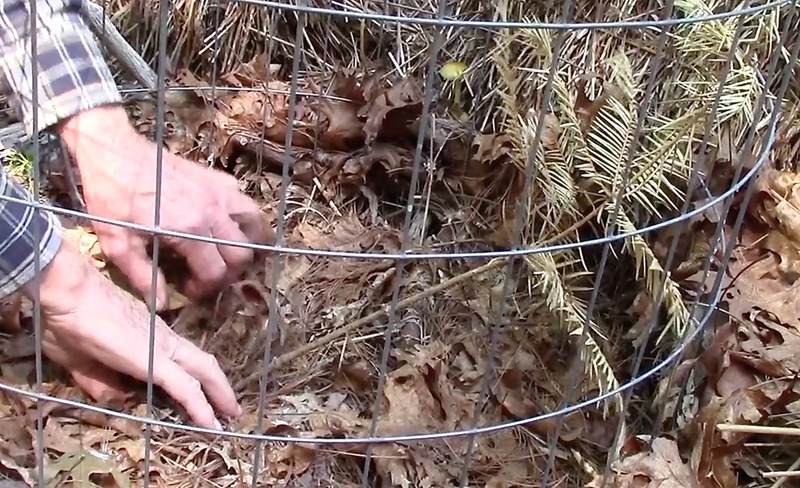 They show how a once-healthy planting can suddenly die  owing to a rodent tunnel that is clearly chimpmunk-size. See how the roots and the living bark have been entirely gnawed away. Notice the light-colored pellets in the root photo; these are perlite. See the editor's note directly below about the importance of shaking out the perlite to deter rodent burrows! Also, in the video itself you will hear Connie remarking on the unusually compact soils and impoverished forest understory (probably owing to excessive cattle pasturing in the past). Perlite + surrounding packed soils we now know will vastly increase the rodent herbivory prospects of even carefully tended outplantings. Editor's note: Thanks to our New Hampshire Torreya Guardian, Daein Ballard, we can now suggest that care must be taken to shake out perlite and loose soil from the roots of potted seedlings prior to planting outdoors. Chipmunks will be enticed to build their winter burrows in the loose soil (and therefore snack on the roots too)  especially if the natural soil in the surrounds is inferior or has a clay pan barrier to digging. The same goes for mulch: Mulch around the base of a torreya will also attract burrowing rodents. VISIT THE RODENT SECTION of our "Propagate page" for more details on how to deter rodent herbivory. 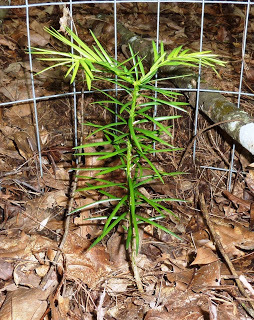 Buford Pruitt report of May 2015: "I am happy to report the seedlings are doing very well. None of them were killed by anything during the winter and all appear healthy and have new branch-tip shoots." PHOTO BELOW LEFT shows the new growth on the largest and oldest seedling (2010 seed), which is the one that I transplanted last summer. There is no indication that the transplanting harmed it. Most of its top branches have 3 new shoots and the others have 2; lower branches have 1 shoot each. PHOTO BELOW RIGHT shows the same seedling from the side looking west. Counting 6@ 4" wire spaces = 24", plus 2" outside the 6 spaces = 26" height. That's approx. 5.2 inches per year of vertical growth. You can see that the branches grow all around the stem, despite being at the edge of a shady forest. It gets about 3 hrs of direct sunlight daily from about 10:30 to 13:30 hrs, plus filtered sunlight another 3+ hrs. STATUS OF 2010 SEEDS: Only one of ten Torreya seeds from the 2010 crop given to me ever sprouted. It was a disappointing result, and other Torreya Guardians had a similar lack of success. Nonetheless, my single seedling grew vigorously, growing six inches the spring of 2012 in (a pot in) Florida. It grew another two or three inches in the first three weeks in the pot at my North Carolina home, was planted in the ground in Brevard NC in May, and at this writing is 21 inches tall (see photo left). I think it likes it here in the Southern Appalachians. 2014 update "Connie Barlow wrote about torreys growing next to white pines. My largest in-ground torrey was adjacent to white pines and was flourishing. I transplanted it a few weeks ago (further away from pines) because a large white pine needs to be timbered and would have crushed the torrey coming down. Some of my other torreys are planted close to white pines. Interesting connection: torrey and white pine. Will think on it." STATUS OF 2011 SEEDS: My 2011 seeds started off rather slowly. None germinated the following spring in Florida, and only three sprouted in July 2012, in North Carolina. Other Guardians reported similar results, and it looked like a repeat of the 2010 track record. But after only a month following their return to north Florida, in December 2012 another four seeds sprouted, in January 2013 another germinated, and the ninth seed germinated in February 2013. That yields a 90% success rate for the 2011 seeds, and again other Torreya Guardians enjoyed a similar pattern of delayed but successful germination. I gave two of my 2011 seedlings to my gardening friend Brack in Williston, FL, and planted another three (height range 9-10 in) at my NC place during the last three weeks. 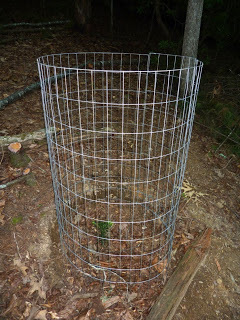 DEER EXCLUSION CAGES: In case you are wondering about the deer exclusion cages, they are constructed of 2x4 inch mesh, 4 ft tall, 1.5 to 2.0 ft diameter galvanized steel fencing, and set a couple of inches into the ground so that roots will grow over the bottom wires to hold them down. 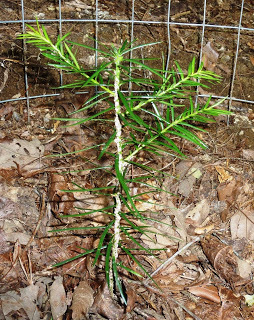 Editor's note: At the Waynesville and Junaluska NC sites, where 31 Torreya taxifolia seedlings were planted in the summer of 2008, no deer exclusion cages were ever constructed and no deer herbivory or antler-scraping problems have yet developed (as of 2013). 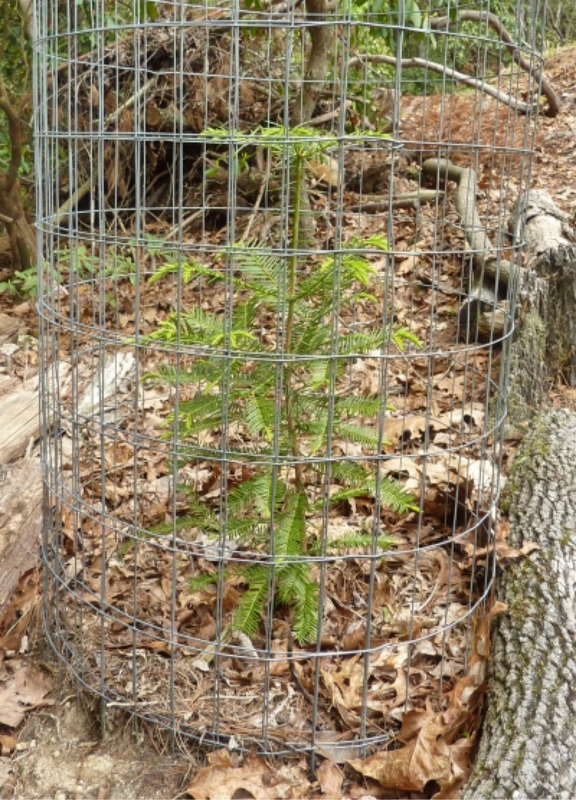 However, at the historically native range of T. taxifolia in and nearby Torreya State Park (along the Apalachicola River of northern Florida), deer exclusion cages have been adopted as an important aspect for nurturing the continued survival of the species there. RODENT EXCLUSION CAGES FOR 2011 GERMINATED SEEDLINGS STILL IN POTS: See photos above of my 4 2011 seedlings (height range 6 - 13 in) that are remaining to be transplanted; they are in pots protected by rodent exclusion cages. 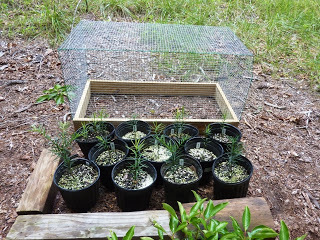 Those cages also contain 15 seedlings from the 2012 crop of 20 seeds given to me. The 2012 seeds were small, pale floaters  quite unlike the larger, darker, denser 2010 and 2011 seeds. I planted 4 to a 1-gal pot (previous years had 2 per pot) in Florida. By late April, 4 of them had sprouted and were growing vigorously. Shortly after moving from Florida to North Carolina, a flush of 8 sprouted during early June 2013 and another 3 have sprouted since then. That totals 15 sprouted seedlings from the 2012 seeds, or 75% success rate thus far. 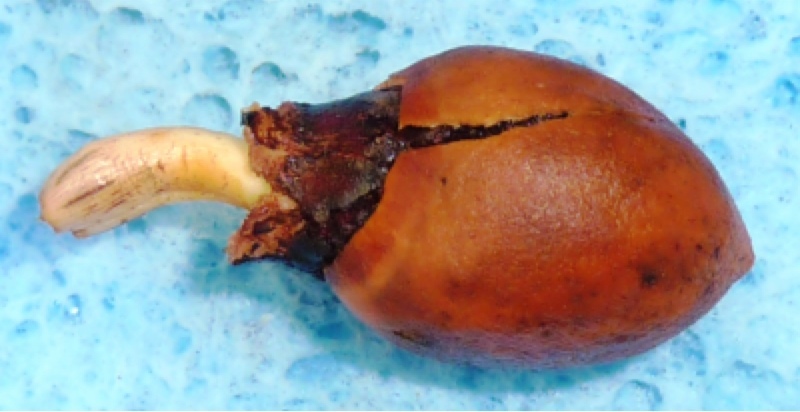 TOP TWO PHOTOS LEFT: "Here are two photos of damage to two growing tips of a germinating Torreya seed. I guess they are roots, as I seem to remember reading that roots are the first meristems to sprout from Torreya seeds. The tips of the two growths were found to be damaged when I dug the seed up this morning, even though I was careful not to damage it myself. It looks like the tips have been eroded away rather than chewed off. Nematode damage is often presented as occurring within nodes along the length of roots, so I don't suspect nemas as the culprits." UPDATE: "Today I took apart my two remaining 4-seeded 2012 pots. Each had two healthy seedlings and two unsprouted seeds. I re-potted the four seedlings into fresh potting soil and set them back under the hardware cloth. Both of the first pot's unsprouted seeds had in fact germinated, but their growing tips were abraded off like the one I reported Saturday. There was an ANT NEST in that pot, and I saw an ant and an ant larva nestled within the remaining limbs of one of the sprouts. It appeared to me that the ANTS had chewed off the growing tip, arresting its growth, which I suspect will kill the seed. One of the other pot's two unsprouted seeds had not yet germinated, which I planted in its own pot, and the last seed was a repeat of the first two. In summary, ANTS OR ANOTHER UNKNOWN AGENT infested three of five 1-gal pots and killed 4 of 19 sprouting seeds, for a 20% rate of mortality. This pest reduced my germination success from 95% to 75%. PHOTO BOTTOM LEFT: "Look at the attached photo of a normal, healthy seedling sprouting node. 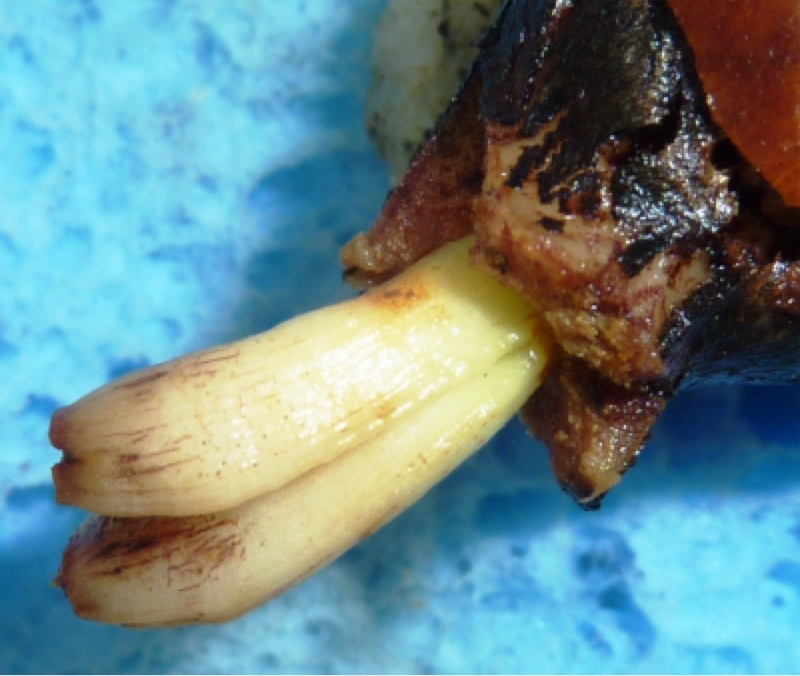 You can see the dark seed, the leafstalk extending out to the upper left, the roots to the lower right, and a vague node from which radiate the roots, leafstalk, and twinned stalks that connect the node to the seed. Evidently, from the seed first emerges a twinned stalk about a quarter-inch in diameter that grows about a half-inch horizontally and then makes a 90-degree bend downward that extends another half-inch or so. 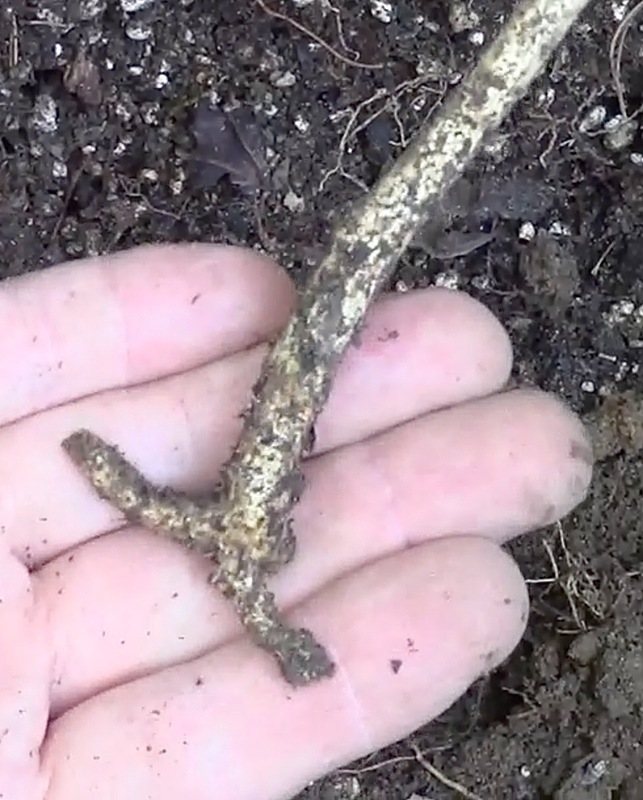 From the tip of the twinned stalk then emerge numerous roots that grow outward and downward from the exterior of the node, and a leafstalk that emerges from between the two sides of the twinned stalk and grows straight up. 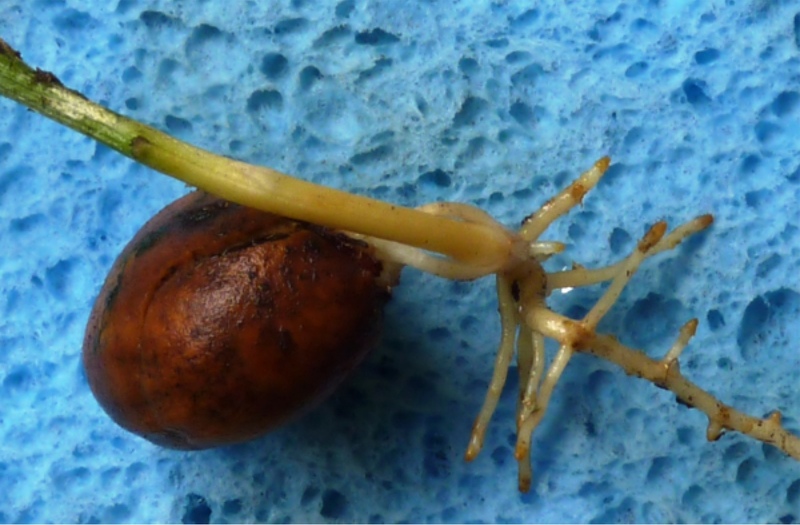 Because both the leafstalk and roots emerge from the node, I'm not sure that what first sprouts from a T. taxifolia seed is technically either a root or a shoot. 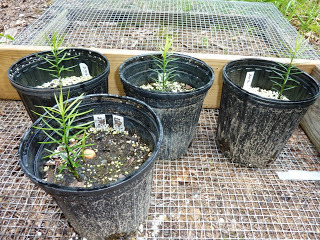 PROGRESS REPORT: I now have five 2011 seedlings in the ground (in Brevard) in addition to the sole 2010 seedling. Based on previous experiences of TGers, I have not planted any under a full forest canopy. All are at edges of openings in the forest where they will get several to many hours of direct sunlight each day. 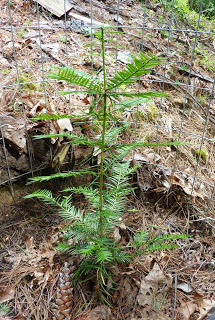 SUMMARY: My Torreya seeds tend to sprout in flushes of three or more at a time, and they tend to do so shortly after I move from Florida to North Carolina in the spring and then back to Florida again in autumn. It will be interesting to see if any of the five as-yet unsprouted 2012 seeds will germinate when I return to Florida in November this year (2013). "I have almost maxed out the number of Florida torreyas (Torreya taxifolia) that can be reasonably planted at my North Carolina home. Eighteen are now in the ground, mostly along both sides of the driveway and a few around the edge of the yard. One is from the 2010 seed crop, five from the 2011 seed crop, and the twelve planted this year from the 2012 seed crop. My previous torrey blog posts document the first six (2010 + 2011) that were transplanted into the ground in past years, and the present post documents the last twelve." Late January 2013 update on receiving 10 seeds from the autumn 2011 harvest: Buford reports that 8 of the 10 seeds have now germinated. See his early January 2013 blogpost reporting the timing and conditions of the first 7 of the 10 seeds to germinate. As of February 2013, 9 of the 10 seeds have germinated. See his blogpost with photos. His November 2012 blogpost on receiving 20 seeds from the 2012 harvest. 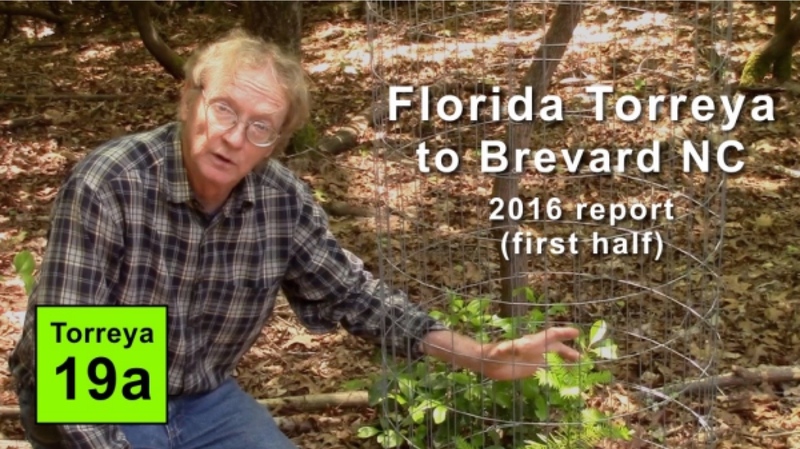 October 2012 update on the Brevard Torreyas, by Buford Pruitt: "The single seedling that germinated from the ten seeds I received from the autumn 2010 harvest has grown another 8 inches since I last wrote about it. It now stands 20 inches tall in the ground in the NC mountains." "I brought it up to my North Carolina mountain lot this spring, but made the mistake of putting it in direct sunlight where it immediately got sunburned. However, after placing it where it would get lightly-filtered morning sunlight and heavily-filtered afternoon sunlight, it quickly recovered and added a couple of inches to its height and the length of each branch. 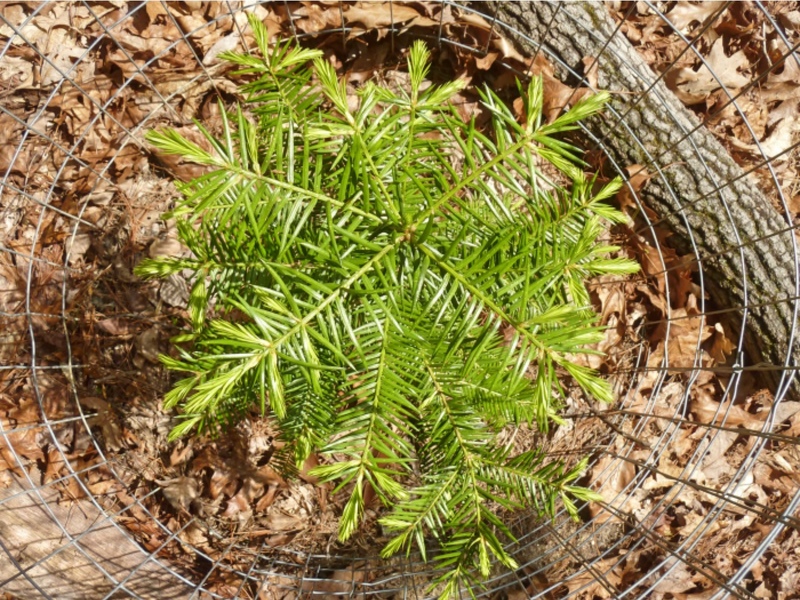 Thus encouraged, I transplanted it into the ground and placed a deer-proof fence around and over it, whereupon it shot up to twelve-plus inches in height and ten inches across in three weeks." Return to Torreya Guardians HOME PAGE.